Negative Capability Press regularly features poets on our website. To submit yourself for consideration, follow the instructions on our Submissions page. 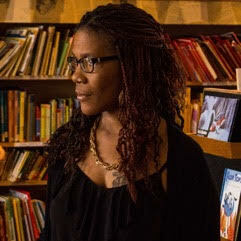 Angela Jackson-Brown is a writer and poet who teaches Creative Writing and English at Ball State University in Muncie, IN. She has an MFA in Creative Writing from the Spalding University low residency MFA program. Her work has appeared in literary journals, such as: Pet Milk, Uptown Mosaic Magazine, New Southerner Literary Magazine, The Louisville Review, Muscadine Lines: A Southern Journal, Blue Lake Review, Identity Theory, Toe Good Poetry, and 94 Creations. Her short story, “Something in the Wash,” was awarded the 2009 fiction prize by New Southerner Literary Magazine and was nominated for a Pushcart Prize in Fiction. Her debut novel, Drinking from a Bitter Cup, was published by WiDo Publishing in 2014. Stay out of the sun. The sun will make you black. Look at how pretty your cousins are. Their skin is fair. Their noses stand pert as yours lays flat. Their hair falls in gentle waves. Your hair coils like a striking snake. What went wrong? I never thought you'd be so black. Mother, I say. What's wrong with me? You're not white but your soul is bleached of color. What's wrong with my sepia-skin? My darkness gets blotted out by your light. What can I do to fix what God has made? I study hard and learn big words, so you will see me. But no words seem to validate me and you never see me. Can't you look at me – just once? Didn’t your mama ever tell you about the blood? he asked. I thought of church. What can wash away my sins? But I knew this couldn’t be that type of blood. by the hands of any man. pink – but not girlish pink. under the cover of Cinderella sheets. IW: Good evening! Before getting into the actual interview, we like to indulge in a bit of fantasy. If we could be anywhere right now, where would you choose to have this conversation? Set the stage for us. AJB: Now that is a good question. To be honest, other than my husband, sons, grandson and daughter-in-law, the people I love the best are mostly all in Mobile, AL, so I would love to be a few miles down the road from them, sitting on the beach on Dauphin Island, sipping a fruity cocktail and talking to you. IW: Dauphin Island is a great place to sip cocktails and talk poetry. Cheers! I'm happy you mentioned your family, as family is clearly a major theme in your work. When you were writing the poems for House Repairs, did you begin by consciously planning to write about your family, or did the theme come about after you'd written several pieces? AJB: Writing poetry has always been the way that I have sought to heal myself. I have kept a diary off and on throughout my entire life and most of my entries ended up being poems. I have a handful of poems from when I was a little girl trying to understand why my birth mother gave me up and why my adopted mother didn’t seem to love me. Thankfully, my birth mother and I are now reunited and close, but the feelings I felt are still real at times, and writing helps me to keep those emotions in their proper perspective. For some reason, the poetic form seems to be the best way for me to explore my rawest emotions without feeling the need to filter them or sanitize them. Now, I will sometimes spend years reworking a poem, but usually, the poems come out of me pretty much how I am feeling or was feeling when the incidents I write about happen. It’s uncanny to me at times that I can go back twenty or thirty years through poetry, and I can inhabit that emotional space almost with a surgeon’s precision. Writing about those feelings and emotions allowed me to move past some of the hurt. Maybe five years ago, I started talking to my friend, Rob Gray, about these poems, and through his innate ability to see patterns and themes, I started realizing I had written my memoir in verse. At the time, he was working on Drew: Poems from Blue Water, so in a lot of ways, I think he and I supported each other through our journey to understand and make peace with our past. My other friend who is a poet, Nickole Brown, did something similar with her book, SISTER, and so I had these amazing poet friends to look to as I started my journey to bring together years of work and create new material about my life. Once I knew for sure that I was going to delve deep into my own personal story, and try to unearth some of my truths, I knew that poetry was the only medium I felt comfortable writing in. An essay felt insufficient and a book felt overwhelming, so poetry seemed just right. IW: House Repairs is written more or less chronologically, moving from the experiences of a young child through adolescence and up into adulthood. I found that the early poems are much more personal, while the later ones become more political. However, as I strongly believe that the political is personal, I don't find it jarring. Instead, I read it as a sort of growth, that as the speaker heals from her own private pain, she becomes more aware of the painful injustices in the world, as well as her own personal hurt. Can you tell us a little about the juxtaposition of both confessional and protest poems here? And do you consider your work to be a political statement as well as an autobiography? AJB: It’s interesting that you categorized some of the poems confessional and some protest, because for me, they truly are interchangeable. The lines are so blurred it is almost impossible for me to know when I am writing one or the other. I grew up in a household where my father was very political. He always volunteered on election day and he made sure everyone in the Black community had access to information about the candidates, and of course, on election day, he was one of the first ones to make sure people had rides to the voting locations. As a Black man in rural Alabama, there was a time when he and others like him, had no voice, so once his voice was heard, he made sure it was always loud and proud when it came to things like politics. So, from the time when I was a little girl, he pushed me to speak out, whether it was to stick up for myself or to stick up for someone else. He pushed me to be independent and strong, at a time when many fathers were encouraging their daughters to be submissive. Because I was shy, the way I would often protest was through my writing. I was writing Letters to Editor of the local newspaper at a very young age if I read something that didn’t seem fair. I remember writing a letter to the Editor of the Dothan Eagle protesting an article and although they didn’t publish my letter, the editor wrote me back and said my letter was good. That made me know back then that speaking out was important. So, in my poetry collection, most of what I write, I consider both personal and protest. When I write about my adopted mother, who was light skinned, and how she shamed me for my African features – dark skin, big lips, nappy hair, and thick hips – I am not just writing about our relationship but I am also writing about a larger sociological issue that exists between some Black people. Colorism is a phenomena that happened within my household but also outside of it. I wanted to illustrate the tension between my adopted mother and I, but I also wanted to start a conversation about the loathing and self-loathing that exists among some Black people even until today. When I write about the sexual abuse I experienced as a child and how it was considered taboo to talk about, I am hopefully illustrating that what occurred in my home, was also occurring throughout other households. And of course, later when I address some of society’s ills, I still try to focus on how those issues affect me on a personal level. I write about how some Black people perceive the police, but I do it through my own personal narrative. I tend to always insert the “I” in my writing, even when I am writing fiction. It brings me closer to the issue, and it makes the issue, whatever it might be, seem less distant. The “I” allows me to insert me into the topic so that I can experience it from within, which gives me a better understanding of what I am writing about. IW: Ha, I also wrote letters to the editor at a very early age. Mine weren't published either, and I certainly never got a reply from the editor! That's fantastic. Hooray for outspoken young women! When someone asks what you do, what is your immediate response? Is it teaching, writing poetry, writing theater, or something else? How do you own and identify yourself as a writer or artist? AJB: I think it depends on the audience as to how I identify myself. If I’m talking to fellow academics, I will often mention that I teach first and then talk about my writing. But for the rest of the world, I usually say I am a Writer who teaches. I also tell my students the same. I want them to know that if writing is what they want to do, it has to be at the forefront. I don’t ever shortchange them as a teacher, and when I am in that classroom, they have me 100%, BUT once I walk out of the building, my mind returns instantly to whatever writing project I am working on at that time. I usually try to open my day with writing and end it with writing if possible. It reinforces in my mind that the writing is always the first priority. It has to come before almost everything else. And I also call myself a Writer as opposed to a poet or a playwright or a novelist most times because all of the areas that I write in are equally important to me. No matter what genre I am working in, I am giving it my all, and at that moment, whether I am writing a poem, a short story, a novel or a play, that work is the most important area of writing to me right then. IW: And I think that really comes through in your writing. Reading your work, I was constantly reminded of Emily Dickinson's quote, "If I feel physically as if the top of my head were taken off, I know that is poetry."